Belgian athlete Stefaan Engels celebrates finishing the Carretera de les Aigues Marathon in Barcelona, his 365th straight race. (CNN) -- He already holds the honor of being the only person to complete 20 Iron Man triathlons in a single year, but now Belgian athlete Stefaan Engels has claimed another world record by running 365 marathons in as many days. Engels completed his year-long mission at the Carretera de les Aigues race in Barcelona on Saturday. 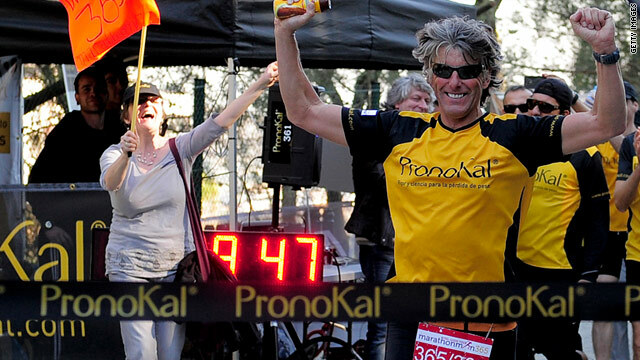 The "Marathon Man" has covered a distance of 9,569 miles (15,401 kilometers) since setting off from his home town of Ghent on February 5, 2010, participating in races in Spain, Portugal, Canada, Mexico, Britain and United States, as well as several in his native country. The 49-year-old has smashed the previous record of the most marathons run in one year, which according to the Guinness Book of World Records was held by 65-year-old Akinori Kusuda -- who ran 52 consecutive races in 2009. But in a statement on his official website, the former graphic designer played down his amazing feat. "I don't regard my marathon year as torture. It is more like a regular job. I am running just as Joe Average goes to work on Monday morning, whether or not he feels like it," he said. "I don't always feel like running, but when I am done, I take a shower, have some physiotherapy for an hour, and that wraps up my day." Engels suffered from asthma as a child and was told he would never be able to do exercise. It was then that he decided he would start running the grueling 26.2-mile (42.195 kilometers) discipline. He said he hopes to inspire others to take up exercise and has encouraged people to run marathons with him in the past.